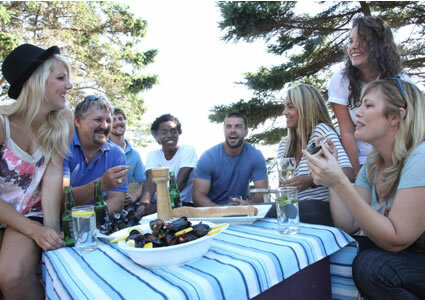 Feel good knowing that PEI Mussels are the 'perfect fit' for your healthy lifestyle. PEI Mussel power: getting seafood strong is a natural choice. You don’t need a health blog or a fitness guru to tell you... seafood is an important healthy choice for any diet. PEI Mussels in particular are loaded with nutrients while being light of calories, which makes them ideal for anyone planning a balanced meal for a balanced life! So what makes PEI Mussels so special? Fresh PEI Mussels are a ‘power food’... not only are they a healthy choice for you and your family, but they are also harvested with a concern for the environment. 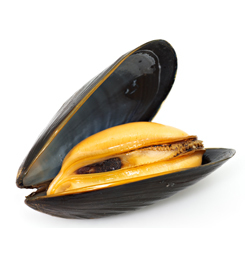 PEI Mussels, besides being an excellent source of protein, have more iron and Vitamin B12 than beef. And that’s really saying something. Most health experts agree that we all should enjoy at least 8 ounces of seafood a week to benefit from high levels of vitamins and nutrients, especially for the heart-protecting omega-3 fatty acids like those found in PEI Mussels. Also, when seafood is eaten instead of entrees that are higher in saturated fat, this contributes to reduced saturated fat in the diet and benefits heart health. There’s a reason why every dietician and fitness expert worth their sneakers places seafood as an essential part of any healthy diet. The benefits just speak for themselves. Compared to other proteins like meat or poultry, seafood is generally higher in long-chain omega-3 fats, lower in saturated fats (such an important benefit for the heart) and higher in the mineral selenium than most other choices. Healthy diets are formed from healthy routines. So why not designate one day a week as a PEI Mussels day and enjoy all the health and nutritional benefits? They taste amazing. They are easy to prepare. And they are so good for you. Now that’s a routine we can all get used to! PEI Mussels have 9 (nine) times the amount of B12 found in halibut. PEI Mussels have twice as much Omega 3 as shrimp. PEI Mussels are light in calories while providing higher levels of most vitamins and minerals than an equal serving of lean pork loin. Fresh PEI Mussels have twice as much iron than an equal serving of beef and are low in saturated fat.